GREENSBORO, NC—Calling it the “ultimate test” of customers’ strength and willpower, local restaurant Boomer’s Bar and Grill unveiled a new eating challenge this week that rewards any patron who can consume a reasonably portioned meal. 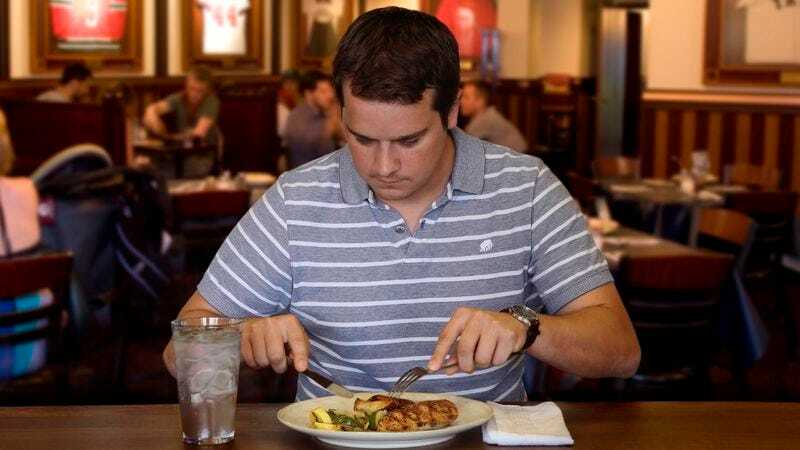 “If any of our customers can tackle an 8-ounce grilled chicken breast, side of seasonal vegetables, and a glass of water, without consuming an additional basket of fries, an appetizer of mozzarella sticks, or any dessert, their meal is on the house,” said owner Mitch Lillard, who noted that contestants are required to fully chew each bite before swallowing and must finish their entire meal in 15 minutes or more. “If you want your picture up on our Wall of Fame, then you have to eat all the chicken and vegetables on your plate without adding cheese, bacon, or ranch dressing, or ordering a soda. And nobody can help you by giving you a few bites of their meal.” With no patron able to complete the feat within its first several days on the restaurant’s menu, Lillard was reportedly considering whether to make the daunting challenge easier by adding a plate of onion rings and a pint of beer.